The hierarchies of celestial denizens, they be fallen or close to the throne of God pulls and mesmerize people more and more as times strides on. It appears that the interest for ‘fallen angels’ in particular is growing rapidly and results in a vast field of opinions and sentiments of both the theological implications of the fall as well as personal encounters with these emissaries of secrecy and light. In the collection ‘Both Sides of Heaven’ 18 essays are presented, most of them have in common presentations of highly personal insights into this common field of experience. Unfortunately the more personal essays are also the more weak ones as they focus on revealing a world of sentiments and not real insights. The planes seems to have been confounded so to speak. This has resulted in a cluster of texts highly varied and of uneven quality. Some essays stand out greatly, such as Kim Huggens ‘Between Gods and Men’ and Emily Cardings’s ‘The Salvation of the Sidhe’. Overall the collection is rich in perspectives, albeit somewhat lacking in depth. This lack is most likely caused by the focus on anchoring most of the essays in personal experience which lead to a dismissal of unleashing the spirit as guide for the experience. 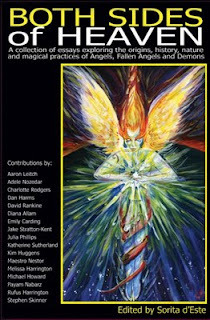 The collection presents a wide array of opinions that all contribute to formulate a contemporary concept of fallen angels and Lucifer’s role within this mystery. This is interesting in itself as the book takes the pulse of the time and measure the common consensus on this particular mystery. In addition to the mentioned essays, there are several good articles about John Dee that are well worth reading, so even being an uneven collection; it does come with its rewards.